Hansen’s disease or leprosy is a chronic disease caused by a bacterial infection and affects the peripheral nerves and mucosa of the upper respiratory tract. 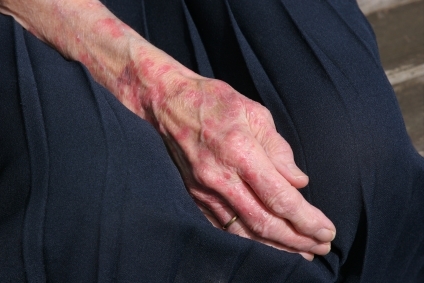 The hallmark sign of leprosy is skin lesions and in untreated cases, the disease is progressive. The disease is progressive and will cause irreparable damage to the limbs, nerves, eyes and skin. Leprosy has been present in the human race for more than 4,000 years and was witnessed in Chinese, Egyptian and Indian civilizations. Within the past 20 years, approximately 20,000,000 people have been cured of leprosy and the rates are increasing. Each year, the World Health Organization registers the global occurrence of leprosy in humans. In 2008, there were approximately 212,802 new cases of leprosy diagnosed throughout the world; however, there was a 4% decline in rates when compared to statistical information from 2007. The overall rates of the disease are on a steady decline in many countries, even in the majority of leprosy endemic countries which are still detecting new cases the rates are still decreasing. Every year on January 31st, the world recognizes leprosy and increases public knowledge and awareness about the disease. The day is focused on increasing the flow of money for research studies, treatment and leprosy education which helps to bring about a better understanding of the disease. Worldwide Leprosy day has been celebrated globally since 1954; the day gives medical professionals the chance to let others know that the disease is curable and raises hope for others that suffer from the disfiguring ailment. January 25th-January 31st, people all around the globe observe Worldwide Leprosy Week. During the week people all over the world get the chance to learn about leprosy, how it is diagnosed, who is affected and how it is treated, which in turn raises social and global awareness of the disease. Leprosy is one of the oldest diseases known to mankind and in its wake; the disease causes untold pain, suffering and stigma to those that have it. Starting in 1991, the World Health Organization started a worldwide campaign designed to reduce the number of cases. The disease common strikes in tropical and subtropical climates and is a serious problem in the countries of Brazil, Mozambique, India, Nepal, Madagascar and Myanmar. Leprosy occurs in areas where there is a dense population, poor health care d improper sanitation and children are at a great risk of contracting the disease than adults. In America, there are approximately 100 cases of leprosy diagnosed and reported each year, which mostly happens in the immigrant population. The disease is contagious but does not easily spread from person to person; researchers believe the route of transmission is via respiratory droplets. Some people have a natural immunity to the disease and once a person has been exposed and is on medications, leprosy is no longer active after 3-4 days. With early diagnosis and treatment, the disease of leprosy can be eliminated from the world. Doctors and medical researchers can prescribe a regimen of prescription drugs that will kill the bacteria that causes leprosy and a person may need to take the medicine for a period of 6 months or for as long as 6 years. Despite the stigma that is attached to leprosy, there is no medical need to separate people with the disease from the rest of society. Through proper sanitation, hand washing, disinfecting and monitoring, the disease can be controlled and leprosy can be prevented.